Users often do not realize how dangerous it is to download freeware from file sharing websites. If you do that on a regular basis, you might not even notice how DC Locknet enters your computer. This adware application belongs to the SuperWeb family of annoying programs. DC Locknet and other similar apps (like Rad Rater, Key Lime Lizard, Boxed Books, etc.) track your web browsing activity and then display customized commercial advertisements. These advertisements are your biggest security concern when it comes to adware, so you need to make sure you remove DC Locknet immediately, to avoid any potential threats. Do not panic: DC Locknet is not a malicious computer infection. It is merely a tool used by software developers to redirect users to affiliated websites. When you click DC Locknet ads and land on some random website, you increase its traffic. Due to the fact that DC Locknet employs the pay-per-click system, each time you click an ad and visit an affiliated website the people behind this application get paid. Although that is not an illegal practice, it raises quite a few security concerns because DC Locknet is very vulnerable to third-party exploitation. After all, the program’s dependence on third parties is apparent from the very beginning. DC Locknet cannot be downloaded from dclocknet.info, because the official website does not provide us with a functioning download button. Therefore, to spread around the internet, DC Locknet makes use of software bundles. Its developers add the program’s setup file to some third-party installer that is available for download from p2p websites. According to our research, it might also come bundled with fake Java, Adobe Flash, or some media player updates. What’s more, this also means that DC Locknet is probably not the only program you have to remove from your computer. Since DC Locknet requires the distribution of a third-party installer, it is very likely that you installed more than just one adware program at the same time. To check what unwanted applications are currently running on your system, scan your PC with the SpyHunter free scanner. This way, you will be given a list of unwanted programs that must be deleted ASAP. Although it is possible to uninstall DC Locknet manually, you should also invest in a licensed antispyware application. Do not forget that manual removal is not always perfect. You might miss some files that are related to adware and other unnecessary software. Running regular system scans with a legitimate computer security program is always a good idea. Also, you should stay away from sites that distribute freeware if you want to avoid the likes of DC Locknet in the future. Select Uninstall a program and remove DC Locknet. Go to Uninstall a program and remove DC Locknet. 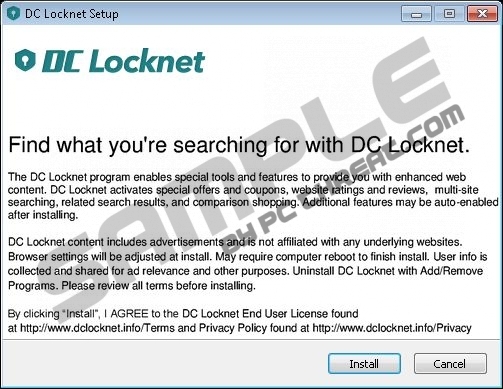 Select Add or remove programs and uninstall DC Locknet. Quick & tested solution for DC Locknet removal.